Art Malone, a legendary racer and track operator, died March 29th due to complications from an air boat crash a few years ago. “Big Daddy” Don Garlits sent along the following letter reminiscing about his old friend. My long life buddy, partner and friend died at home this morning at 6 AM. This was the final result of an Airboat accident several years ago, Art was injured severely and never fully recovered. I talked to him on March 27th and he was in good spirits, thought he had lost a lot of weight. The brute of a man was down to 175 pounds, my weight! His wife Sandra was at his side. It grieves me to write this, but I must as Art and I go a long way back, in 1942 we rode the Twin Lakes School bus together, became friends and never had a quarrel. Art was younger than I, but a tall boy and timid at that young age. I once beat up a bully that was picking on him and we have been very close ever since. Art initially started racing round track cars and I once borrowed a flathead Ford engine out of his stock car to run an event while my engine was being repaired, I won with Art’s engine, but he continued to race the round tracks. Then in 1959, I was burned severely and Art and his wonderful late wife Lorraine came to the hospital and he offered to drive the Swamp Rat I car while I recuperated. Art took to Drag Racing like a “Duck to Water”, setting the new Drag News 1320 Record at his first outing in Sanford Maine, 183,66 MPH, breaking my old record set at Houston TX the week before the Chester fire. 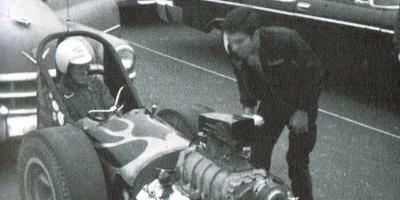 Art continued to raise the 1320 record several times and in 1960 built his own car at Al Williams shop in Kansas. He won the US Fuel and Gas Championships held in Bakersfield CA in 1963 with his own home-built car, Ed Iskenderian was his Crew Chief! He set the oval track record of 181.561 MPH at the Daytona Speedway on August 28th 1961, receiving the $10,000.00 prize posted by Bill France of NASCAR fame for the first person over 180 on a closed course, driving the “Mad Dog” a winged version of an Indy car, built by the late Bob Osiecki from Chester SC. The “Mad Dog” now rests in the Don Garlits Museum of Drag Racing as a tribute to this man’s many accomplishments. We teamed up again in 1984 putting “Garlits and Malone” on Swamp Rat 26, a car removed from the museum and refitted with modern parts purchased by Art to be able to run the 1984 NHRA US Nationals, we won the race, the competitors were calling us “Dinosaurs”, we then proceeded to the NHRA World Finals, winning again! Art and I then won the NHRA World Championships two years in a row, 1985 and 1986. Art was inducted into the Drag Racing Hall of Fame in 1997 and he supported the Museum from the very beginning. This is just a brief summary of Art’s life, as it would take an entire book to list it all, he was a man’s man and will be missed by all racing fans and competitors. Don Garlits Museum of Drag Racing Inc.
R.I.P. ART,YOU WILL BE GREATLY MISSED.